In a previous post I discussed why a floorless pyramid is the best sort of shelter for wilderness travel but what it can’t give you is a good view when it’s raining. I’ve been reviewing, and comparing, interesting ultralight options for the past few months – the Lightheart Solo (and Duo) and the custom cousin of the Solo pictured here. For this version, I specified a Cuben Fiber rain fly, dual zip doors, and one side of the fly set up as a porch for cooking and views. The dual doors let me stow gear on one side and cook and enter/exit on the other, and allow the whole thing to be completely unzipped with the fly rolled up when neither weather nor insects threaten. 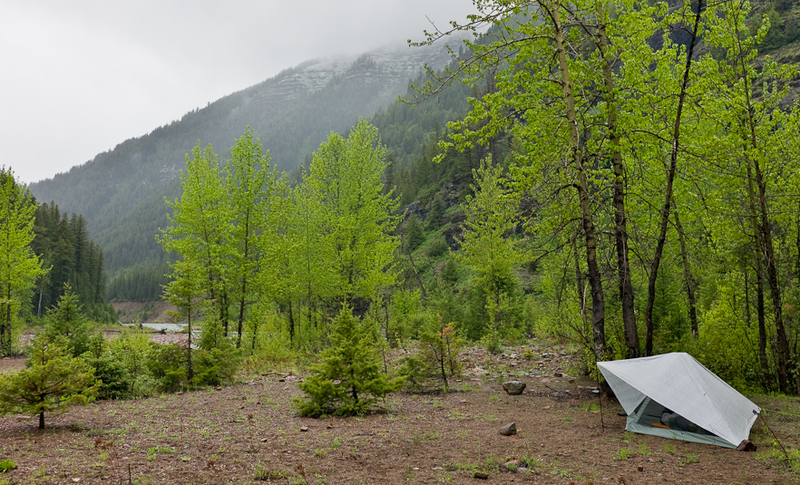 I took this new 19 ounce shelter into the Great Bear Wilderness last week but didn’t have time to seal the seams, and we got 2 1/2 inches of rain on the trip in 48 hours. So I had puddles in my tent, but the views were great. I was using a synthetic quilt, so the puddles didn’t do anything terribly threatening once I wrang out my sleeping bag, and I still slept warm. This is where the advantage of synthetic gear, and duplicity in insulation (quilt + insulating jacket and pants made from high loft synthetic insulation) really comes in handy. Earlier I lamented about having too many tents but once I seal the seams on this one I think it will rapidly become something I use more, at least on short trips when I don’t mind the extra weight of a tent, especially as bug season beckons.